THE STORY: Three murders, all committed under seemingly impossible conditions, have decimated the Denny family in Death in the Dark (1930). A locked apartment building and a death by gunshot in a darkened bedroom, another death by gunshot done in full view of five witnesses, and a shooting in a jail cell with no one near the victim nor any gun in the cell. How has the murderer achieved these miracle crimes? Intellectual criminologist Stephan Bayard with the help of police Detective Jules and Bayard's close friend George Stacey Bishop manages to weed through the chaff and get to the heart of all the mysteries. Along the way the reader is treated to various lengthy and esoteric discussions of fine art, the state of modern music in 1930, and the criminality of thymocentric personalities. Once again, the influence of Dr. Louis Berman rears its ugly head in yet another early American detective story plagued with talk of eugenics and the bogus science of determining personality based on endocrinology. THE CHARACTERS: Stephan Bayard is another of the many American detectives descended from C. Auguste Dupin and Philo Vance. He is as cold and rational as Dupin and enjoys his esoteric monologues like Vance. Within minutes of learning of the death of Dave Denny, a music concert promoter, Bayard is sure that the man has committed suicide. But a key left in a door when it should be hanging on a hook, one of Denny's diehard habits, will bother the criminologist until the final pages. Bayard much like Vance is also a cultural connoisseur and we get several didactic lectures on art, music, and literature with loads of name dropping of both familiar and obscure painters, sculptors, musicians and writers. Bishop is the S. S. Van Dine stand-in of the book and is both mythical author and narrator when in fact "Stacey Bishop" is the pseudonym of modern musician George Antheil. Dr. Stein, a radical endocrinologist, is one of the many fictional doctors inspired by Louis Berman's work on controlling personality and behavior through use of hormones and surgery of the pituitary and thymus glands. Berman's radical theories and practices which flirt with controversial eugenics theory caught the imagination of many genre fiction writers at the time. Donald Clough Cameron's criminologist, Abelard Voss, for example is another fictional detective who likes to espouse Berman's theories. Antheil takes this specious science to the extremes making Stein something of a mad doctor tinkering with experiments more suited to a science fiction shocker. There is a scene where Bayard and Bishop visit Stein's lab and we see his experiments have led to the development of a bizarre machine that in its description sounds like something out of Fritz Lang's Metropolis. It seems to involve the extraction of personality via electricity and the wearing of a metal mask. I read these sections several times and still can't make sense of them. The finale of the novel is straight out of a shudder pulp magazine and is completely out of place for a story that was up till then purely cerebral and focussed on logic and ratiocination. The suspects are mostly made up of stock characters with paper thin personas like Mrs Denny, a bed ridden wealthy matriarch; John and Frieda Alvinson, composer and his "boyishly handsome" wife who serves as the 1920s exotic female figure; a profligate brother in Aaron Denny who is financially irresponsible and hated by his stepmother; and a handful of servants who are nothing more than symbols. Bayard and Stein are the only characters in the book that approach anything remotely resembling human dimension, even if it is mostly intellectual. Even the murderer comes across as lacking in any real depth until the last couple of chapters when motivation is revealed and we get more nonsense about the thymocentric personality. 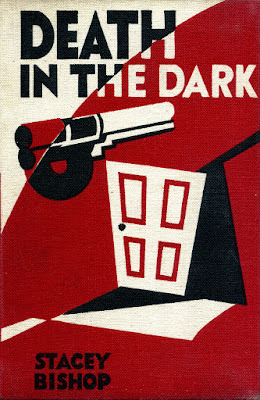 INNOVATION: Death in the Dark is overloaded with intriguing new ways to tell a detective novel. If they all tend to obfuscate the story that's no real failure. They often made me laugh in astonishment rather than in ridicule. Bayard draws up numerous fact sheets that serve as tabulation scenes highlighting the oddities that make each crime impossible. He also informs Bishop that Sir Richard Muir, the lawyer involved in the trial of Crippen, liked to compose "poems" during his case summations which he would read to the jury at the close of a trial. Bayard then composes his own series of blank verse tributes to each of the three impossible crimes pointing out each puzzling incident that is nagging his overstimulated brain. In effect we get two separate and protracted tabulation scenes: one in a bulleted list format, the other in a pseudo-poetic format. Over the course of the book the impossibilities are each dealt with individually with each solution presented as it is discovered rather than revealed in the concluding chapter as with most detective novels. 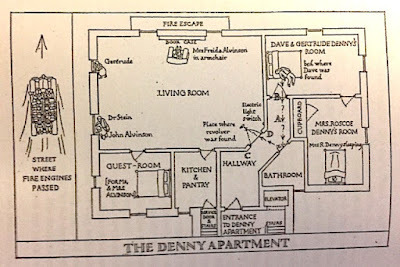 The problem of a key left in the locked door of the Denny apartment is oddly the one problem that is not explained until the novel's end. The jail cell murder -- the most ingenious of the three crimes -- is surprisingly solved almost immediately but having its roots in more pulp fiction gimmickry the bizarre method adds another incongruous element of the absurd to the overarching somber tone. 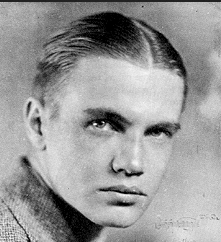 THE AUTHOR: George Antheil was an aspiring modern music composer during the 1920s who is now best remembered, not for his concert work, but for his music scores of movies like Repeat Performance, Knock on Any Door and House by the River. Death in the Dark is supposedly a cathartic revenge book which Antheil wrote in reaction to his disastrous Carnegie Hall debut in 1927 of Ballet Mécanique. Each of the victims in the murder mystery is a thinly disguised version of the people Antheil held responsible for his public humiliation. The story of the novel's creation, the concert and the people who served as the inspiration for the characters is told in an Afterword by Mauro Piccinini. In passing Piccinini also touches on Antheil's other claim to fame -- his physics work and the development of the "frequency hopping spread spectrum" invented in tandem with actress Hedy Lamarr. EASY TO FIND? 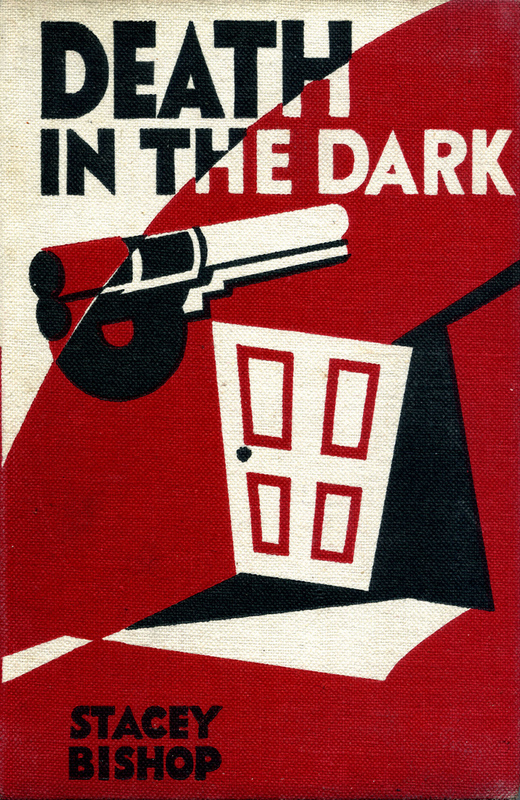 John Pugmire has reprinted this extremely rare detective novel as part of his Locked Room International imprint. It's available only as a paperback via amazon.com and nowhere else. LRI does not distribute to bookstores as it is a print-on-demand operation utilizing Amazon's CreateSpace self-publishing platform. Don't hold your breath trying to find an original 1930 edition published only in the UK by Faber and Faber in a very small print run. The only copy I've ever seen offered for sale was back in 2010 and was priced at $1500. Currently, the only copies are in a much more affordable $25 paperback edition just released a few weeks ago. Click here to go the book's sale page on amazon. I can always rely on you to introduce me to new obscure authors. 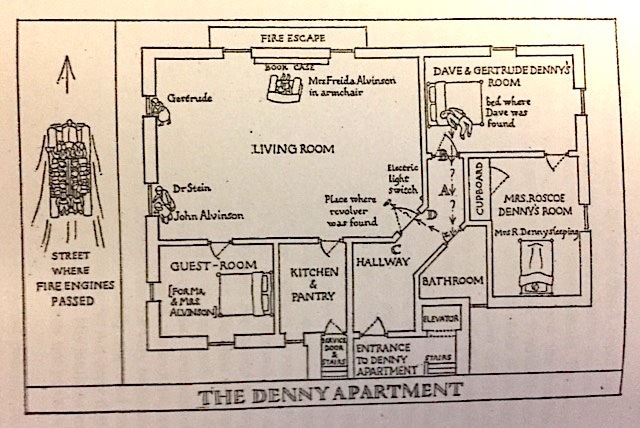 Quirky mystery fiction is always tempting and who could resist such a floor plan. Best get saving my pennies so I can get one of the reprints. Sadly like most of these true rarities this book is not a stellar accomplishment, but I enjoyed reading it. Your use of "quirky" is the perfect adjective. There's some rudimentary fair play detection in the book. Too much depends on timing and sheer luck on the murderer's part. I'll wager that purists and the locked room fanatics out there will be greatly disappointed. I figured out two of the three impossible crimes before they were solved by the detective. The second murder is solved so quickly the reader is never really given a chance to work it out. Well I'm not always that good at solving the howdunnit aspect so he could well fool me! When I first learned of Antheil a few years ago I went in search of every movie I could find that he scored so I hear his music. I was underwhelmed. The score to House by the River, for example, doesn't seem radical or cutting edge at all which is what I expected. 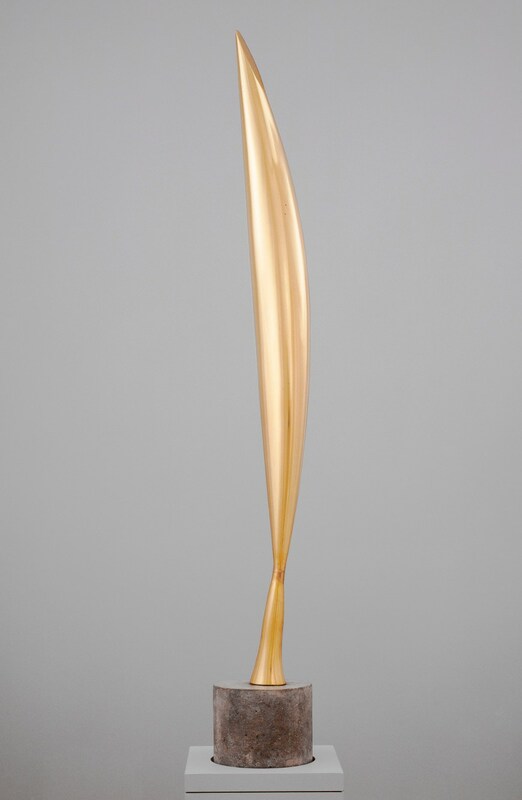 Hollywood seems to homogenize even the most avant garde artists. But... if interested much of his symphonic music can be found on YouTube. There are several videos, also, of "Ballet Mechanique." It was revised in the 1950s and rescored for pianos and xylophone. Two of the most interesting are the art and music installation done in Washington DC's National Gallery in which the entire piece is performed by robots! Player pianos were programmed to play the music much faster than humans could along with other electronically rigged sound effects and drums. 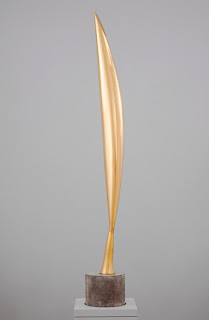 The other is the only live performance I could find of the original score which inludes the three airplane propellers with "percussionists" inserting wooden boards next to the blades at key moments as the three propellers turn at different speeds. Now that's cutting edge! Thanks for your review, John! Your opinion seems to agree with that of Adey who described it as an odd, badly written book, but he still found it interesting enough to recommended it. So this reprint edition has been jotted down on my wish list. The plotting will not stand up to your rigid standards, TomCat. But I think there are enough unusual aspects to the plot and the weird narrative experiments like the tabulation scene done in poetry that will keep you entertained. Just finding all his influences and allusions to well known detective novels will be fun for you. Looking forward to your review. Sounds like a quite singular experience, and I'm always keen to see people play around with the format of the detecive novel...the difficulty comes when those digressions into alternative approaches actually STOP it being a detective novel, but that doesn't sound like the case here. I like your comment above, John, "like most of these true rarities this book is not a stellar accomplishment" -- it's a curious line we walk sometimes, isn't it? The hours spent tracking something down, the joy of finally acquiring it...and then the muted disapointment that it failed to live up to billing. I like to think I'm getting better at not allowing my expectations to run away with me, but there'll always be the odd disappointment that took what turns out to be a disproportionate amount of time, money, and effort to find. Thank heavens for reprints and easy disappointments, I say! As Moira says above, Antheil's life is much more interesting than this oddity of a mystery nivel. I'm fascinated by his symphonies and can't stop listening to his very radical music. Stravinsky was his idol but he was also a musical maverick way ahead of his time. People like John Cage did similar experiments decades after Antheil that were were called genius. Enjoyed your review, John, and not only because it helped me clarify that while I don't believe I'm hopelessly thymocentric I do tend to lean that way. I'm not one to believe in personality determined by physiognomy or biology. I dislike reading passages in old books about characters with weak chins signifying femininity in men or a devious nature or characters with eyes set too close together denoting obvious criminals. It's just another form of bigotry. I keep running across Berman and his "glandular theories" as applied to criminology in many vintage mysteries and I find it hard to believe that it was accepted as scientific fact. It smacks of the medieval belief in "humors" and how their distribution within a person's body made someone either choleric, melancholic, phlegmatic, or sanguine. The Hex Murder has been reprinted!